After three less than whelming whiskies to start the month, and also to start my run of reviews of malts from the Speyside and the Highlands this month, here is one that I know is very good. This is a Longmorn bottled by the Single Malts of Scotland label of Speciality Drinks (now Elixir Distillers, I think) a few years ago. I opened it for my local group’s February tasting and it went down very well with the group. Here now are my notes. 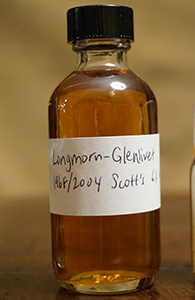 This is the fourth of the five ancient Longmorns bottled by Gordon and MacPhail for van Wees in 2011. I’ve previously reviewed the 1972, the 1969 and the 1968. All were excellent, and the 1969, in particular, I thought was magical (I’ll probably review the 1964 next month). I have very little to add to what I’ve already said in my preambles to those reviews (and I really want to duck the question of the financial irresponsibility and likely decadence of buying such expensive whisky, even in the form of a four-way split) and so let’s get right to the notes. This was released for The Whisky Exchange’s annual Whisky Show back in 2010 under their “Masterpieces” label. I had the opportunity to purchase it then but felt it was too expensive: I believe the price was £120 ex. vat. Those were the days. Anyway, I’ve never had a late-1970s Longmorn before (not that I can remember anyway—I do have two small children). This is from a bourbon cask (many of the older ones I’ve had have been from sherry casks). As to whether this will reach the fruity heights of its storied stablemates from earlier in the decade, I don’t know, but can only hope. This is the third oldest of the five ancient Longmorns bottled by Gordon & MacPhail in 2011 for van Wees in the Netherlands. I have previously reviewed the 1972 (outstanding) and the 1969 (which I gave the highest score I’ve yet handed out). While I purchased full bottles of the 1969 and 1972, the 1964, 1966 and this 1968 I only have 6 ounces each of, having split them with three fellow Minnesota whisky geeks (the 1972 was also originally part of this split—I purchased a bottle after tasting it). The prices of the remaining stock all but doubled shortly after this purchase and so this is all I have and all I will ever have; and as it’s highly unlikely that 1960s/early 1970s whisky of this quality will be available again any time soon for the prices we paid this is almost certainly the first and last time that I will get to taste such a stellar lineup of whiskies. Each pour is thus very special. For this reason I have avoided getting into my shares of the three that I do not have full bottles of in the wings, waiting for special occasions. Well, I suppose Bob Dylan’s 74th birthday is as good a time as any. This is the whisky that caused me to abandon my better judgement and buy an entire parcel of K&L’s exclusive selections for 2013. I’m a sucker for older Longmorn and when I saw a 21 yo Longmorn from a sherry cask offered for less than $100 I didn’t ask myself if it might possibly be too good to be true and ordered it. And then, because I am weak, I ordered a bunch of other whiskies to go with it. Some turned out to be good (this heavily peated Jura), some were okay (this Imperial), some were boring (this Bunnahabhain) and some were not good (this Bowmore). You’d think I’d have learned my lesson, but no: I bought a few more of their exclusives this Spring (those turned out much better, by the way—more on those next month). 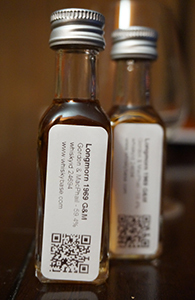 In December I reviewed an ancient Longmorn bottled by Gordon & MacPhail for van Wees in the Netherlands. I gave that one, a 42 yo distilled in 1969, 95 points, my highest score yet. That one was from a series of single first fill sherry casks which also included one from 1964, one from 1966, one from 1968 and one from 1972—all bottled together in 2011. My last review of a Longmorn saw me give out my highest score yet. That was for the staggeringly good 1969-2011 bottled by Gordon & MacPhail for van Wees in the Netherlands. Later this month I will have a review of another bottle from that series (thr 1972-2011) and I may also get around to a 31, 1978 bottled for the Whisky Exchange a couple of years ago. And so I am in the decadent position of feeling like this 26 yo from 1987 bottled by Cadenhead’s is not that old and not that special. Excuse me while I slap myself. This is the the oldest Longmorn I’ve yet tasted. 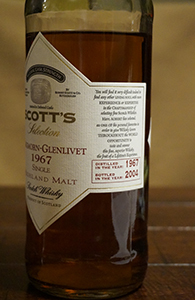 I referred to it in my review of the 1968-2004 from Scott’s Selection as probably the last Longmorn of this age and era that I will get to taste. This one is from Gordon & Macphail and was bottled for van Wees in the Netherlands. I couldn’t spring for a full bottle but also couldn’t resist paying for two 20 ml samples when the good people of Whiskybase made them available. As the samples were not themselves cheap I hope this one will live up to the standards of the other ancient Longmorns I’ve had. At the risk of being accused of lapsing into decadence, here is another ancient Longmorn from Scott’s Selection. This one is the 1968-2004 release which, like the 1968-2003, is at a very high abv compared to the two 1967’s released around the same time (both of those were in the low 50%s; see here for the 1967-2004). This is the only one I have not previously tried of the five Scott’s Longmorn-Glenlivet bottlings released in the mid-2000s and so I am really looking forward to it. It’s also the only one I never actually saw in the wild myself so I can’t kick myself for not picking up a bottle. 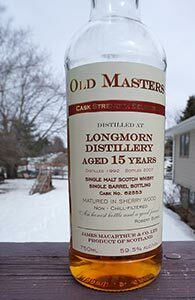 I have another sample of a different ancient Longmorn from this period on my shelf (that one’s from Gordon & Macphail) and once I’m done with that one I’m probably done with getting to taste ancient Longmorns. Prices are now through the roof. An end of an era? Hopefully, Longmorns from later decades will be as good with as long aging but they will not, I am pretty sure, be as (relatively) affordable as these whiskies once were. Oh well. Here is another of the excellent old Longmorns released by Scott’s Selection in the early-mid 2000s. I’ve previously reviewed the great 1968-2003 and now here is one distilled a year earlier and bottled a year later. Until a couple of years ago these bottles could be found relatively easily at reasonable prices, but now they seem to be mostly gone, and what’s left seems to have largely had its price hiked. So it goes. I opened this bottle for the gathering for my friend Rich’s birthday in September, the one that yielded the samples of the Clynelish Manager’s Dram and the Talisker 30s (plus some others yet to be reviewed). And it was as good as I remember it being from the one previous occasion that I’d got to taste it. Old Longmorn (especially from the late 1960s and early 1970s) is usually utterly brilliant stuff—see here and here, for example—but I’ve not had quite as much luck with more recent/younger Longmorn, whether official or independent—see here and here (and here for an exception). As to whether this is just the luck of the draw or whether Longmorn’s spirit reaches its peak at a much later age, or if there was something crucially different about that earlier period, I don’t know. I do know that this 11 yo from the German bottler Alambic Classique does not lift the average of recent/young Longmorns. 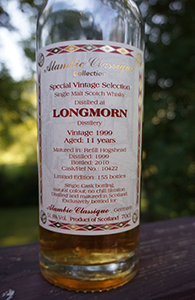 Here is a Longmorn bottled a while ago by James MacArthur, an established indie. I’m not sure if their availability in the US has been uninterrupted. This bottle is from 2007, as are two more bought at the same time, but I don’t recall any since prior to the big splash they made a year or two ago. If you know if they’ve been here but quiet the whole time or if like Cadenhead’s they exited and then re-entered, please write in below. This bottle (and a Bowmore and a Caol Ila) were split three ways with Michael Kravitz of Diving For Pearls and Florin, who fights crime up and down the Pacific Coast by night, all the while keeping up appearances as a rodeo clown in the greater Barstow area. This review is being posted simultaneously with Michael’s (link forthcoming as soon as I have woken up and found it: and here it is). This is, in fact, the first of five simultaneous reviews, all to be posted on Friday mornings. As usual we have not discussed the whisky or our notes ahead of time. Let’s see what we both think.